Last week the day everyone was waiting for finally arrived, the much anticipated Boots 70% off sale. Now while I'm actually not one to take part in this sale and truth be told this was my first time in doing so I didn't get loads. I didn't start work till 12 that day so the things I did want I had hidden away up in the stockroom so that I could buy them later in the day! But enough blabber, if you follow me on snapchat 'darlingjordan' I'm sure you'll have had enough of me talking about sale day! Now onto what I bought! Starting with a bathing product. Okay so I felt like I wouldn't have 100% taken part in the sale if I hadn't bought some sort of shower gel set just because it was cheap. So I took part and picked up the Sanctuary Spa Explore and Let Go set which contained a body lotion, shower gel, scrub and exfoliating mitt, all packed into a little bag with a price tag of only €3! I feel like everyone goes into this sale for some Soap and Glory, but I told myself no and refused to pick up 1 of each bathing set there was. Instead I picked up their Kalidescope which contains 3 of their Kohl liners in a blue, silver and black. This was down to €2 and was the last one in stock so I had to have it. 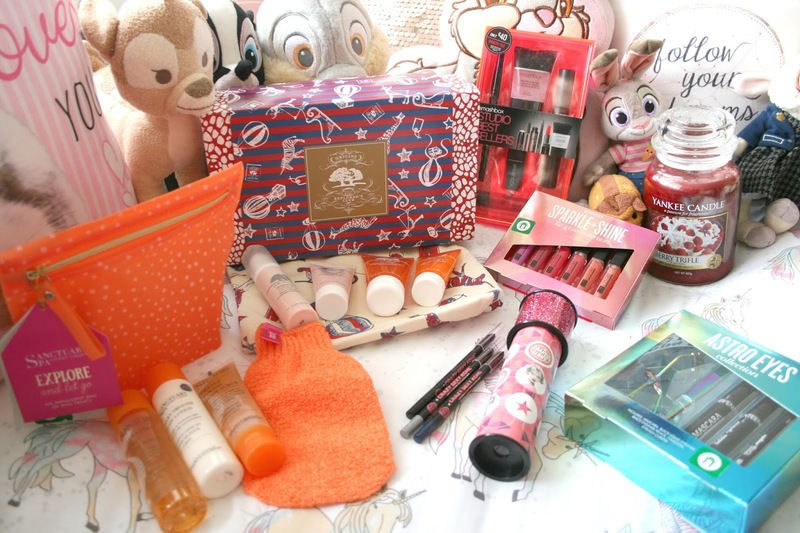 I then picked up two items from the Seventeen Christmas range. Starting with the set of 6 mini lip glosses, now truth be told I'm not a lipgloss person, I rarely ever wear them. But products in miniature form just get me and I have to have them, plus they were down to €2.40 so I couldn't not buy them for that price. The other set I got from Seventeen was the Astro Eyes collection which consisted of a kohl liner, liquid liner and a mascara along with a multicoloured eyelash curler and tweezer. Truth be told I just wanted this set for the lash curler and tweezer because they look so cool. This set was down to €5.20 I find Seventeen stuff you buy off the stand good but anything in these sets I find just a bit gimmicky. I mean some of their mascaras for e.g the VaVaVoom mascara I love so why not put things like that in the set rather than the generic mascara. But anyways that out of the way like I said 99.9% of me just wanted this for the lash curler and tweezers. I then picked up a large Yankee Candle for €9.60 We had a lot of Christmas scents left and while I'm not one for spices etc the Berry Triffle scent reminded me of sweets so I just had to get it. I've been burning it in my room ever since and it smells absolutely divine! Lastly I picked up the Origins Explorers Club set which contains 4 minis and a little pouch. I fell in love with this when I seen it and had been hiding it around the place for a month in hopes that nobody else would buy it at the half price tag which was €26. Thankfully nobody did so I was able to hide it until 70% off day. This set ended up working out at €8.33 which absolutely made my day! Inside you get your printed pouch, then from the Original Skin range the Renewal Serum with Willow Herb and the Retexturizing Mask with Rose Clay. Then from the GinZing range the Refreshing Scrub Cleanser and the Energy Boosting Moisturiser. Finally, while not in the 70% off sale but on its own sale price I ended up picking up the Smashbox Studio Best Sellers. This was down to €26 but with my discount it worked out at €23.33! I was planning on buying the mascara anyway which was €23 so it seemed silly not to pick up this set. Included is a mini photo finish primer, full size mascara, eyeliner and lipstick along with a mini highlighter. Smashbox makeup is starting to become my little addiction and I'm loving getting to try out more of their range! And so that's everything I picked up in the 70% off sale this year! Did you pick up anything in the Boots sale?